For all of those companies out there that don't feel like they are the next Netflix, Apple, or Google, author Dave Norton says, "take heart!" In the emerging Digital Economy consumers are looking for solutions that close the gap between thought and action. Today consumers are sharing more than ever--not because attitudes about privacy are shifting, but because companies are getting really good at providing value they cannot pass up. If your company can establish trust with consumers, add transparency, and offer a compelling solution for a completing a task, they will give you the data you ask for. If you are a digital skeptic or digital denier, this book will convince you that we are in the midst of yet another seismic shift in business models because of digital. This time the force for change is not mobility; it’s data and the Internet of Things (IoT). The more devices that connect to each other, the more digital creates a personal ecosystem, called Digital Context. Digital Context is as distinct a shift in business strategy from omni-channel as omni-channel was from the first multi-channel business models. Companies need strategies grounded in consumer behavior to guide the development of business models, brand experiences, and customer journey work. 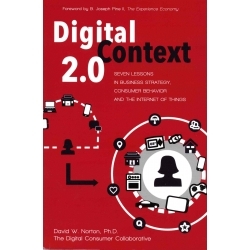 Based on two years of in-depth research on consumers, Digital Context 2.0, provides seven lessons on how to prepare your business for the next wave of technologies—and make your customers happier. A watch is not a watch. An IoT-enabled razor is not a razor. An IoT-enabled hearing aid is not a hearing aid. They can each do the basic functionality that the name implies but they do much more and will be hired by consumers to do more than what the name of the item suggests. The consumer hires the tool to do much more than what you originally intended the product to do. The more tools that connect to each other the more each tool becomes a part of an ecosystem that supports other activities. That ecosystem will change your business model. Critical to every business model are the marketing, transactional, and customer service channels that ensure that you can share your offerings with your customers. We have progressed from a world of single channels, to multi-channels, to omni-channels, and now to Digital Context. Along the way the channel has become smart and when channels become smart they queue things. Despite the constant hacks and security breaches, most consumers share their data with companies freely if they understand and agree to the purpose for sharing the data. 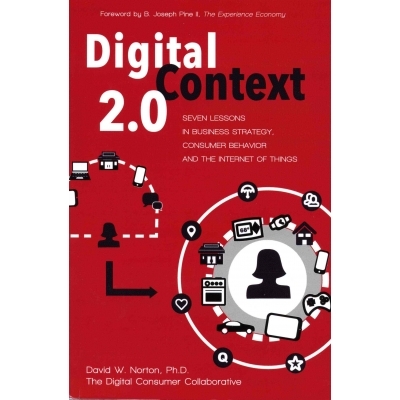 The Internet of Things and Digital Context depend upon the free flow of data between things. Lesson three explains why consumers share data, who the Context Comfortables are, and why they are important to every company’s business strategy. Increasingly, if companies are to be relevant and differentiated to their customers, they will need to understand modes. Modes are ways of thinking and behaving that consumers ‘get into’ that helps them get things done. By targeting a mode for your value proposition, you are effectively aligning your goods, services, or experiences with the way that consumers go about doing what they want to do. Companies that are focused on creating content for distribution should turn their attention to focusing on ways to create the Package. Smart Media companies need to find ways to increase the amount of data that travels with the content they produce. In Digital Context, consumers will want their content to be informed by different data types. Companies are used to very basic data being embedded in or attached to content. However, context-aware content requires that companies find ways to share data about much more. The promise of Digital Context cannot just be to speed things up. Context must improve the wellbeing of people. Research in positive psychology can help companies think about delivering happiness to consumers. Digital Context should tap into that body of research. This lesson explores why a loyalty mindset is wrong for Digital Context and why a positive engagement mindset is what companies need to go after. Using a fictional example based on P&G's Swiffer product, the author brings the other six lessons together into strategic activities that guide business decision-making.